Tuxedo cats have a new ally, and I’m super-excited! Hi everyone! Did you know that 75 percent of the cats in the world are black and white? Of course, some of us are more black and some of us are more white, but the fact that there are so many of us makes it hard for us to stand out at adoption time. But a new website has popped up that helps tuxedo cats get the recognition and good homes they deserve. And I got to interview Daniel, the administrative assistant behind the Tuxedo Cat website. 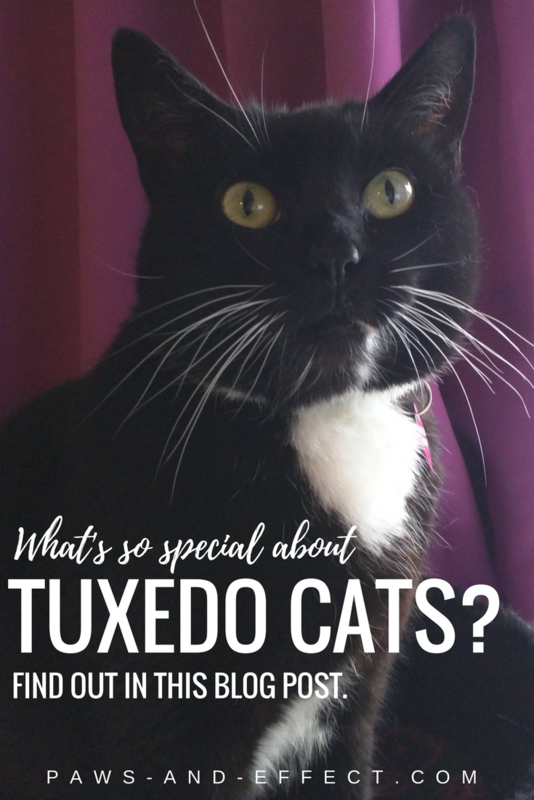 Tara: What inspired you to create a site all about tuxedo cats? Daniel: My wife and I decided to adopt a cat back in 2014 as we thought they would be the ideal pet for us given our circumstances at the time. We were both working full time and living in a good sized first-floor flat. 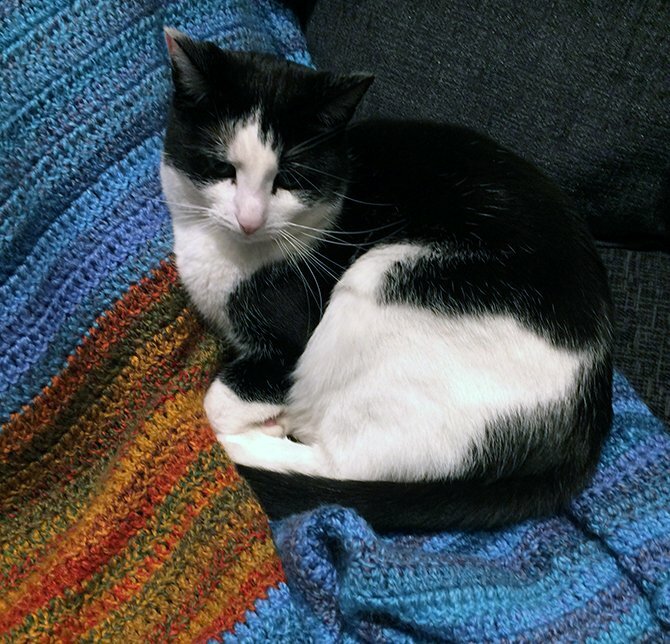 So we ventured over to our local cattery and had a look around, what we immediately noticed was that there were a lot of (incredibly cute) black and white cats of all ages in there…anyway, we ended up adopting a 6-month-old black and white kitten that we named Whisky. As a result of these findings I decided to set up the Tuxedo Cat website to promote their plight, encourage people to adopt more tuxies, and hopefully to learn a few things and have some fun as I do it! Tara: Do you live with any tuxedo cats right now? Daniel: Well, Whisky, of course. She’s an energetic 3.5 year old black and white cat. Over the last year, she has grown in confidence. When we first got her, she was a very nervous, timid cat who would make a point of ensuring that she was well out of the way every time a guest came to visit. However, over the last year she has grown significantly in confidence and will now happily come down and see what is going on–even when the house is bustling with guests. This is Whisky, the brains and inspiration behind the Tuxedo Cat website. 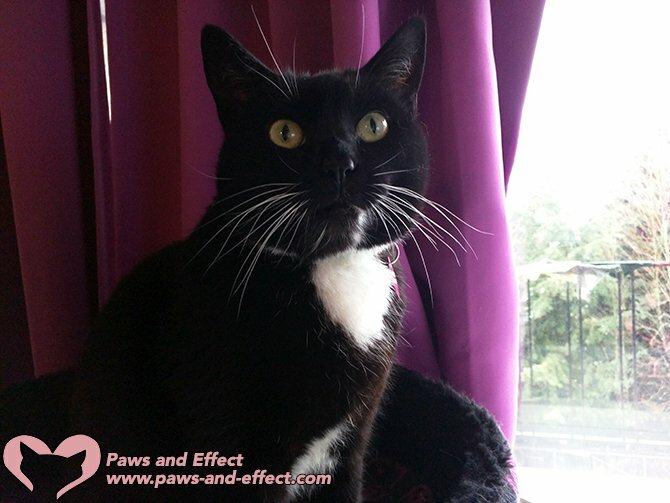 Tara: Do you find that tuxedo cats have special characteristics as compared to other cats? Daniel: Tuxedos aren’t a specific breed of cat but rather a coloring which is common amongst many different cat breeds and mixes. Consequently the characteristics of tuxedo cats are as broad and varied as they are throughout the entire cat population! Tara: How have tuxedo cats changed your life? Daniel: Whisky was the first cat we have ever had. Previously my wife and I would have both called ourselves dog people; however, since adopting Whisky, we have fallen in love with her feline charm and have come to understand and appreciate cats in a myriad of new ways! Having a cat website definitely makes us very much cat people now! Tara: How do you feel tuxedo cats are treated in shelters and by people in general? Daniel: Tuxedo cats spend up to 10 days longer in the shelter on average than cats of other colorings. The unfortunate truth is that because they look boring or common, people routinely overlook them in favor of more colorful or interesting-looking cats. People forget that the color of a cat’s coat has little bearing on the cat’s character. You can be certain that a black and white cat will bring you just as much fun, entertainment, and love as any other cat! Tara: Does Whisky have anything she’d like to say? Whisky: Dan’s a good cat keeper but don’t believe everything he says here. The website is pretty much entirely my work, Dan just does the admin work. I’m both the inspiration and brains behind the site! Tara: We’re based in the United States. 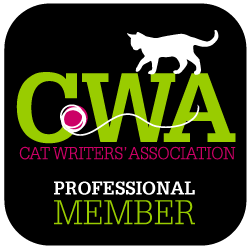 Do you think there’s a difference in attitude toward cats in the UK versus in the U.S.? Daniel: While I’m no expert on people’s attitudes to cats in the USA, one thing that does jump out at me is cat declawing. In the UK it is pretty much unheard of to declaw a cat, with vets deeming it cruel and unnecessary, whereas I believe in the USA it is a fairly common practice. Personally I think it isn’t fair to declaw a cat, even if your cat is kept exclusively indoors. Thanks for taking the time to talk to me, Daniel and Whisky. I hope people learn lots of cool things by going to your website! Why Is My Black Cat "Rusting?"